Apple is investigating after two iPhone 8 Plus owners shared pictures of the device burst open due to possible battery failure. "We are aware and are looking into it," an Apple spokeswoman confirmed to MacRumors. The first customer is reportedly a Taiwanese woman, who said her iPhone 8 Plus burst open despite charging with an official Apple power adapter. Chinese media sites reported that the device has been returned to Apple, as part of its routine investigation of these isolated incidents every year. A second customer from Japan shared a picture of an iPhone 8 Plus with the display assembly detached from the device's aluminum enclosure. 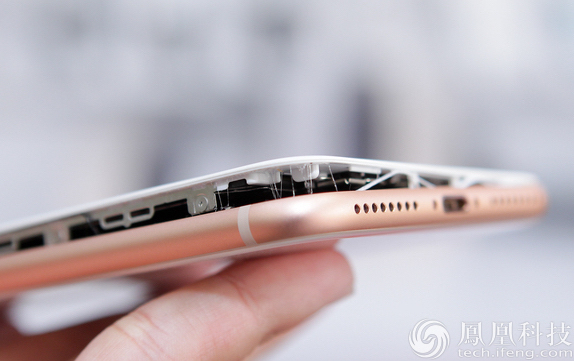 In both cases, it appears that the battery may have swelled due to gases inside. The expansion then placed too much pressure on the display, causing it to pop open, which may actually help avoid a fire. With millions of iPhones coming off of Apple's production lines every time new models launch, it's common for a few to have battery failures. It's simply an inevitability with lithium-ion batteries. It happened with some iPhone 7 models, and it'll probably happen with iPhone X and whichever models come after. It's only when reports of battery failure become a larger trend, as Samsung learned the hard way after dozens of Galaxy Note 7 devices caught fire last year, that it truly becomes a problem. Update: A third iPhone 8 battery failure is being reported in Hong Kong. Samsung users would be like we had this feature for more than a year. “NO NEED TO WORRY” in big bold letters. Who are you guys? Apple’s PR department? This will be on first page on every website by tomorrow morning, mark my words. Will apple have a note 7-2017? Yes. 2 phones out of the 10+ millions shipped. Oh, so that's how you open the battery door. Everybody panic! Non-issue if two devices had batteries swell and no fires or explosions. Cool, it just pops open. Number one, Macrumors didn't caps lock it like your post is indicating. . Number two, they're just simply reporting what is being discussed across the Internet, they don't want to insinuate any facts until Apple corroborates anything. No I disagree. I read this article and also thought the Apple bias was strong with this one. Why can't they simply report the story without inserting opinion? If Apple did a press release saying "Don't worry", then Macrumors can report that too. But no need to insert their view into the story. happens to the laptops too..
it's always happened.. never widespread. so far, appears like it won't be a widespread issue with the latest releases either.